Whenever we get the opportunity to go out into the community we jump at it. We took that opportunity in February and March to share with a number of groups. Below are the highlights of a couple of outreach programs. February 28 was Father Lacombe’s birthday and we were invited to Father Lacombe School in Lacombe, Alberta to share the history of Father Lacombe and the St. Albert mission. We spent the day meeting with students from grades 1 to 9 and teaching them about Father Lacombe’s interaction with the First Nation and the Métis of the area including all of the great things that he did and the people that he touched throughout his life in Alberta. It was a great day and we are looking forward to going back next year to celebrate his birthday again with the staff and students in Lacombe! 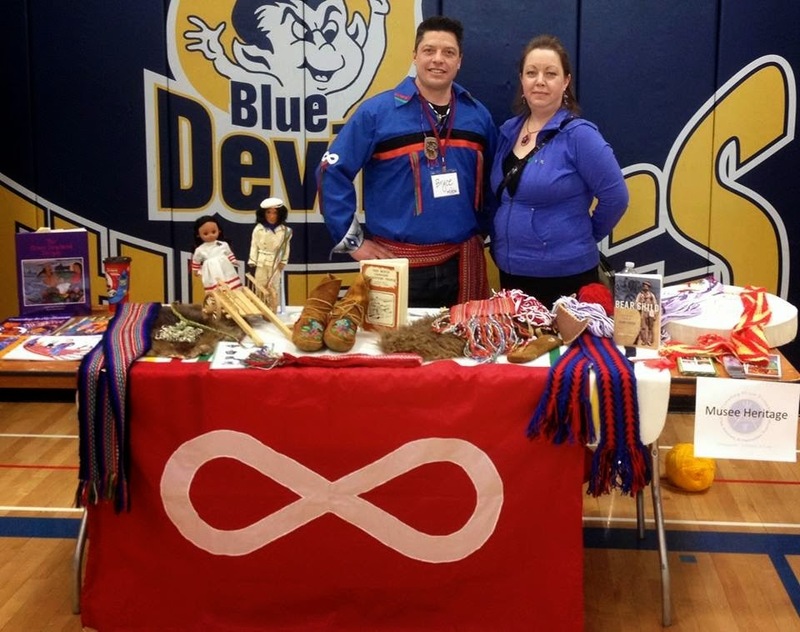 On March 6th, we were invited by the Creating Hope Society to participate in their Aboriginal Youth Career Fair at Eastglen School in Edmonton, Alberta to set up a display and have a craft of some kind that would showcase Aboriginal culture. So of course we took the Finger Weaving activity. It is always good for me to get out and see everyone that I don’t always get to see while working in the Musée. Other cultural representation included Bryce Morison from St. Albert. First Nation performer Mark McKennit (Dancing Fox Spirit), also from St. Albert, Darrell Joe, and Chayla were also there in their First Nation regalia. There were booths from the Dept. of Defenses’ Bold Eagle program, Edmonton City Police, Rupert Land Institute and the Belcourt Brousseau Métis scholarship program to name a few. Look for us out in the community, you never know when you will see us.